Sometimes, usually when I least expect it, the Sky Gods throw me a bone. But I sure didn’t look for one this past Saturday night. Man, it’s July in Possum Swamp. What does that mean? Heat. Humidity. Bugs. Clouds. With a low off the Florida Panhandle and the remnants of Tropical Storm Alex still hanging on in the Gulf, we’d be lucky to just have “cloudy.” “Violent thunderstorms” more likely. The dadgummed Clear Sky Clock gadget I’ve got on the kitchen computer’s desktop seemed to be acquiring more blue squares as Saturday morning came and went, but I still smelled S-K-U-N-K-E-D. Nevertheless, by Saturday afternoon I’d begun to consider my agenda if I did happen to get in some hours. Even if the sky cooperated, I knew I’d have to contend with an Old Moon in the sky after midnight. What could I do in about three or four hours? Mostly, I could try to do the remaining dozen Herschel II’s in Hydra. I knew good and well I’d be unlikely to get ‘em all, since the sky wouldn’t be dark enough for even the Stellacam to pick up the Water Snake’s 12th – 13th magnitude galaxies until most were gone. If I could gather even a couple, though, I’d be ahead of the game, and wouldn’t have to stay up quite as late/early come Hydra’s eastern reappearance late this fall. What else? 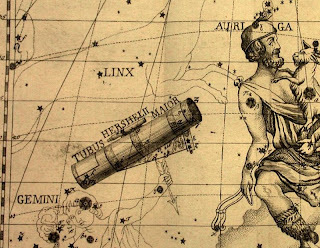 The summer constellations, some of ‘em, still needed to be visited: part of Serpens, Sagittarius, Vulpecula, and Libra all contained Herschel IIs I’d yet to log. If I made my way through that, there’d still be the Big Enchilada to work on, the Herschel 2500. I haven’t said much about the 2500 part of the Herschel Project here, not yet, but I am continuing to pursue the big list, the complete Herschel, all those objects—not quite 2500, actually—that were recorded by William and Caroline, and which went on to form the spine of the NGC. I am little more than ¼ of the way into the big list, and there is plenty to do at any time of night. So, I sat and waited for the weather gods to make up their cruel minds. By the time five o’clock rolled around, Wunderground.com and Weather.com were still talking “partly cloudy,” but when I wandered out onto the front porch for a look-see, the sky was blue in all directions. Time to get a move on. The night’s telescope? Weather still looked a mite unsettled, and covering the Sun’s disk with my fist revealed a significant glow around it that’s indicative of haze. C8 and Stellacam II it would be again. Yeah, there’s a penalty for using the Stellacam in that it multiplies the amount of gear I have to drag to the dark site, but the reward is well worth the pain, even the pain of lugging all that stuff back in the house at three a.m.
With the C8/Stellacam combo, 13th and 14th and even (small) 15th magnitude galaxies are nothing. I may have to crank up the gain on the camera if the skies ain’t what they oughta be, and the resulting video may not be too pretty, but I get to see a lot—including spiral detail in nondescript galaxies that would likely elude a telescope three times the size of Celeste, my C8. Yes, the C11 might show even more, but The C8 and her CG5 mount are a lot less of a handful and an excellent compromise for shorter runs, as this one would no doubt be. The trip out to the PSAS darksite in Tanner-Williams was uneventful. I left Chaos Manor South at 6:15 to give myself plenty of time to set up all the Astro Stuff, and headed west to the accompaniment of Miles Davis’ Birth of the Cool. I couldn’t help noticing the western half of the sky was completely cloud-free. That is usually a good sign, since most of our weather systems move west to east. With the mess off Florida in the picture, however, I knew it was unlikely to be quite that simple this evening. Setup was not a pain. The thoughtful folks who own our observing site, a private airfield, had mowed the grass in the area where we set up the scopes, and that made everything more pleasant. It meant that when I (inevitably) dropped a small part, I’d actually be able to find it. It also meant the bugs were a little less troublesome. 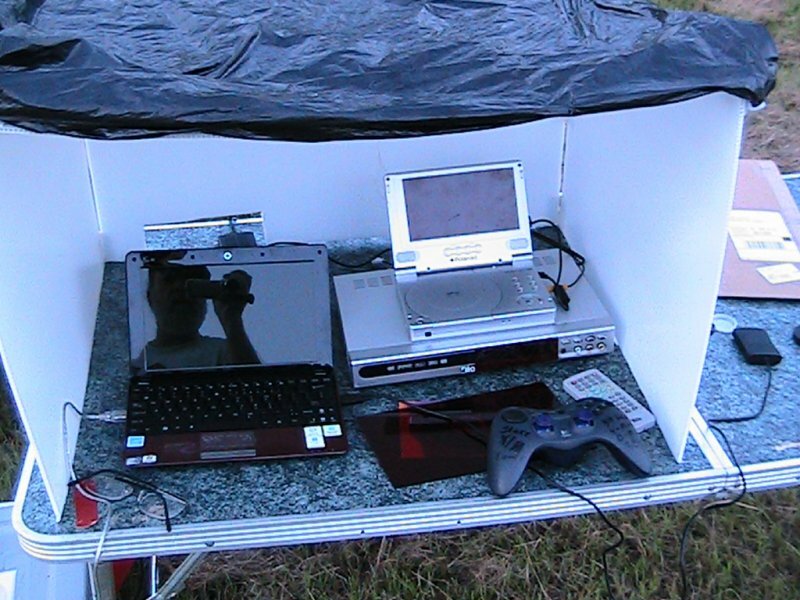 Nevertheless, the first thing I did was pull the observing table out of the car and plunk my Thermacell down on it. What’s a Thermacell? If you live where insects make summertime observing miserable, it’s the best “astronomy” accessory you’ll have run across in years. It’s a small gadget, a little larger than a TV remote control. There’s a grill on the front that holds a pad saturated with a natural insecticide, Allethrin, which is derived from chrysanthemum flowers. This pad is heated by a disposable butane cartridge, and disperses a small but sufficient amount of insecticide, enough to keep over 200 square feet bug-free. How well does it work? Tremendously well for me. It is especially efficacious with mosquitoes. After the Thermacell has been running for about 10-minutes, they are just gone. It doesn’t seem quite as effective with gnats—it takes longer to shoo them away, but eventually they will leave, too. In my experience, and the experience of the many amateur astronomers who’ve been using the Thermacell for the last few seasons, it is harmless to optics, humans, and pets. It don’t even kill the bugs, just runs ‘em off. The odor it emits is noticeable but not unpleasant, and it frees me from having to slather-on the DEET based repellents. DEET may harm optical coatings, and will most assuredly melt plastic. Do you really want that stuff on your skin? Didn’t think so. Get down to Wally-World or the Bass Pro shop and get a Thermacell. 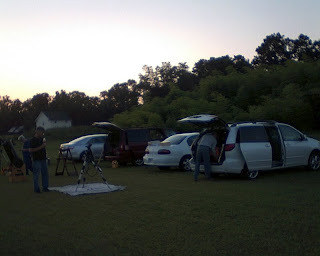 Skeeters warded-off, it was time to ready the telescope and mount. For once, all went smoothly for me, but just as I finished securing Celeste to the CG5, I heard, “Uncle Rod! HALP!” Seemed as how my fellow CG5er and PSAS member, Joe, was having a hard time with his rig. No matter what he did, the mount was dead as a doornail. No red light. Hand control display didn’t illuminate. Nuttin’ honey. As I’ve said more’n once, most recently in my last Herschel Project Report, the CG5 is, if nothing else, reliable. I’ve never had a major problem with mine over the five years I’ve owned it. That doesn't mean it’s perfect, but the two problems the CG5 is most prone to suffer are easy to rectify. One of these problems is shared by just about every Celestron go-to telescope: the power cord’s connector fits too loosely in the receptacle on the mount. The connection is poor, and a NexStar can lose power or reset its computer right outa the blue. Annoying. Very annoying. Fortunately, the solution is simple. The mount’s plug has a pin that’s in two halves. Spread those pin-halves apart a little with a small knife, and the connection much improved and the problem banished. The other sin the CG5 is heir to concerns the tiny power switch on its control panel. After a while, usually years but sometimes months, this switch goes bad and the mount will not power-up. Joe’s scope was stone cold, and I figured his switch was the likely culprit. We did check the batteries and power cord, but no dice, which left the fricking-fracking switch. A little (actually a lot) of exercising eventually brought it back to life. Beaudreaux was good to go for the evening, but what about thereafter? Some folks replace the CG5 power switch. Some jumper across it. Others, who are as lazy as I am, just leave it on after power is restored (maybe after blowing it out good with some canned air), and thereafter turn the mount on and off by plugging and unplugging the power cord. That’s what I’ve done for several years with no problem. Joe’s night saved, it was time to for me to light-off the C8, since the bright stars were now peeping-out. 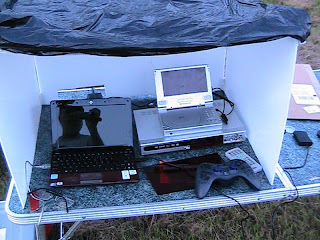 Booted-up the computer and started NexRemote. Unlike last time, there were no dumb mistakes on Unk’s part, and the go-to and polar alignments went smoothly. The last couple of Calibration Stars were dead center in the C8’s eyepiece when the scope’s slew ended, a good sign. I figgered it would be a real sweet evening. That’s what I figured—till I looked at the sky. The weather had looked pretty good at sundown. 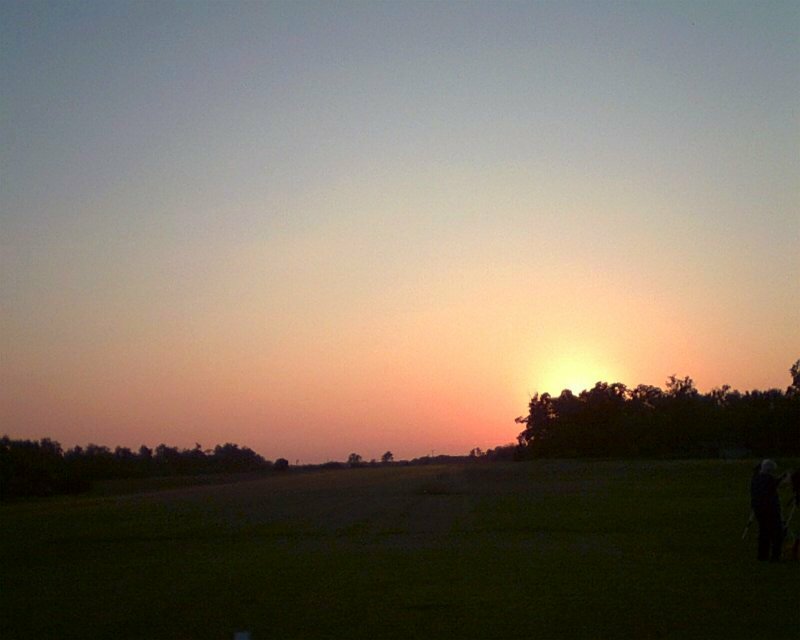 Some lingering haze, but nothing that would be a show-stopper. Until now. As I’d finished working on Joe’s mount, I’d noticed some clouds along the eastern horizon. As I done told y’all, that’s usually not a worry. Tonight, with a tropical low sitting off the Florida Panhandle, it was a different story. The dratted gray things were soon moving toward the west at full speed. What to do? I got the Stellacam mounted and focused-up in record time and headed for Hydra before the wily Snake disappeared over the horizon or clouds caught up with him. Despite its position low on the western horizon, magnitude 12 NGC 5078 (H.II.566) is impressive. This 3.2 x 1.0’ edge-on SA(s)a is accompanied by a little fuzzball of a galaxy, IC 879, which is 2’22” to the northwest. The main galaxy sports a bright core and a beautiful dust lane. NGC 4105 (H.II.865) is one of a pair of galaxies about 1’ apart, the other being NGC 4106. On both the POSS plate and on the monitor, 4105 shows what appears to be a stream of stars perhaps drawn-off by interaction with its buddy. NGC 4105, an E3 elliptical of magnitude 11.6, is a good 2.7’ across. With clouds now covering most of the sky, it was break time, if not time to start thinking about packing it in and packing it up. I wasn’t quite ready to throw in the towel, though. There was a nice breeze aborning, and the clouds were moving rapidly. Hell, there was even a hint of “cooler and drier” in the air. I suspected it would eventually get better, for a while, at least. While waiting, I found a star field in the clear and touched-up my focus, which, even given the punk seeing, was a wee bit soft. Yeah, I’d used the Bahtinov mask to focus, but I’d been lazy (my middle name) about it. My last mount-calibration star was Albireo, which I used for focusing. I figgered I had got the diffraction spikes properly aligned despite the interfering patterns of the double’s companion star. Nope. That’ll larn me: focus is very important with the small-chip Stellacam; do not take shortcuts or hurry. NGC 5812 (H.I.71) is a round fuzzie-wuzzie of an elliptical galaxy 2’ in diameter. It is in the field with several small galaxies, the most prominent of which is magnitude 15.1 IC 1084, 4’52” to the east. NGC 5861 (H.II.192) is attractive. It’s elongated with a bright center, and spiral detail is obvious, including one prominent arm. This feature of this SAB is only visible when the seeing, which is not too good, settles down. An SABc spiral galaxy, NGC 5605 (H.III.120), is near face-on and fairly small, 1.5’ in size. It does display tightly wrapped arms at times. NGC 5878 (H.III.736) is a pretty SBb with a bright core and a little spiral detail. A magnitude 16 star is 46” south of the nucleus and easily visible. Magnitude 13 NGC 5757 (H.III.690) is surprisingly good. Intermediate in orientation and set in a field rich with stars. Bright core and extensive oval outer envelope. The next two objects, NGC 5595 (H.III.121) and NGC 5597 (H.III.122), form a close pair, 4’9” apart. 5595 is the more interesting of the two. It’s a strongly elongated SABc, and shows two stark spiral arms. 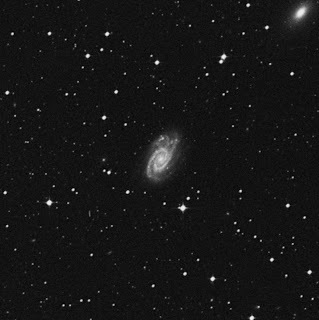 NGC 5597 is rounder and doesn’t give up its more tightly wound arms as easily, though they are sometimes visible. In long exposure images, NGC 5728 (H.I.184) shows some dim, outlying, M81-like arms, but on my monitor I’m only seeing the central areas of this SA. While some traces of its spiral nature comes through once in a while, that is fairly fleeting. I can see the magnitude 15 star that lies 57” south of the center of the galaxy. 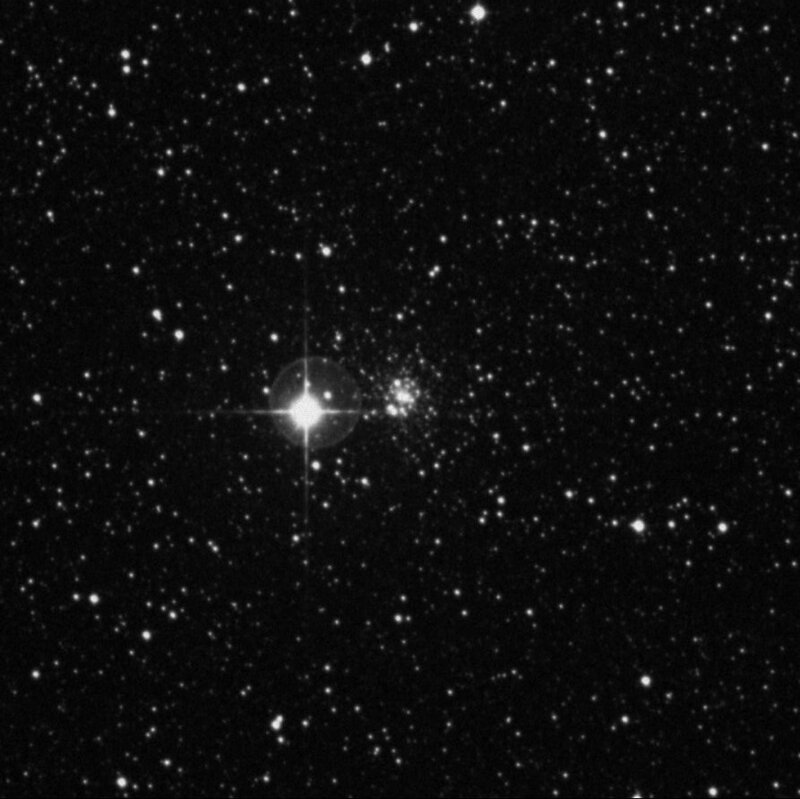 NGC 5791 (H.III.691), a magnitude 12.6 E6 elliptical, is the brighter of two close galaxies; the other being IC 1081, which is 2’40” to the northeast. The target object is bright and strongly elongated, 2.6 x 1.4’. NGC 5970 (H.II.76) is a small SBc barred spiral. Very nice—bright, elongated core. I can barely make out some suggestion of tight arms. NGC 6070 (H.III.553) is, on its POSS picture, a good looking SAcd multi-arm spiral. With the C8 and Stellacam I can easily see its patchy armed nature. Large, 3.5x1.9’, and bright at magnitude 12.45. Looks a lot like a miniature Sunflower Galaxy. At 10’ across, NGC 6596 (H.VIII.55), an open cluster, is just about indistinguishable from the background star field. I can identify the group with the aid of a POSS plate from SkyTools 3, but it is not obvious. The same goes for NGC 6507 (H.VIII.53). This magnitude 9.6 galactic cluster is even bigger, 14’, and fills the screen. Slewing around a bit does allow me to see the star-count drops off at the edge of this elongated mass of suns. NGC 6717 (H.III.143) is the famous globular cluster Palomar 9, a loose magnitude 8.4 dab of stars 5.4’ across its major axis. It would be easier to make-out what’s going on with it if it weren’t for a magnitude 4.98 field star a mere 1’50” to the north. Decent resolution, with numerous stars visible. 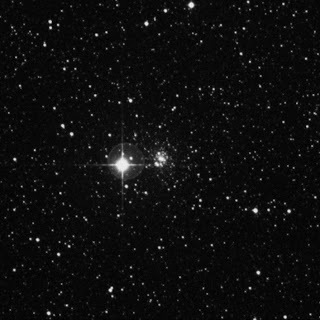 Vulpecula’s NGC 6800 (H.VIII.21) is a small, 5’, open cluster. Not well detached from the rich background. NGC 6793 (H.VIII.81) is much the same. Maybe a little more identifiable, but not much. The field is not as rich as that of 6800, but this cluster is less rich as well. One notable triangle of brighter stars. It was still absurdly early, not quite eleven, so I needed something to do until Moonrise. “What” was obvious: that Big Enchilada. The natural place to continue with that on this evenin’ was Boötes. By the time I finished my Herschel IIs, the Herdsman and his galaxies were west of the Meridian and well away from the light pollution. Did I say “galaxies”? Yep. Many folks don’t realize it, but Boötes, who is near Coma and away from the Zone of Avoidance, after all, is just chock-full of ‘em. The Herschel list, the complete list, contains, believe it or no, over 100 Boötes objects. I didn’t get ‘em all, but at least I made a right good dent in them. I ain’t gonna make you read through my haul; many of them were “round, fuzzy, 13th magnitude,” but quite a few of the Herdsman's island universes are surpassingly beautiful, and it’s not too late to catch ‘em. Eventually, Luna was up high up enough to become a pain, and we called it. The evening had gone smooth, real smooth for me. No major mistakes. No Mothman. No Skunk Ape. 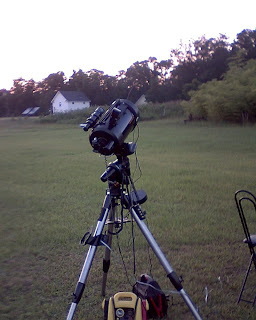 I’d used the same telescope/mount combo I’d used the week before, which had made set up and operation much easier. Will it be “three in a row” for the C8/CG5 this coming weekend? Don’t know. From where I sit right now, under the rain and clouds generated by another low, this one off Louisiana, it seems doubtful. But I was skeptical this past Saturday, and it turned out to be one of my better summertime observing runs since last July’s Chiefland expedition. NO, you never can tell. Next time: I look forward to getting back to visual work this fall with my 12-inch Dobsonian, Old Betsy. 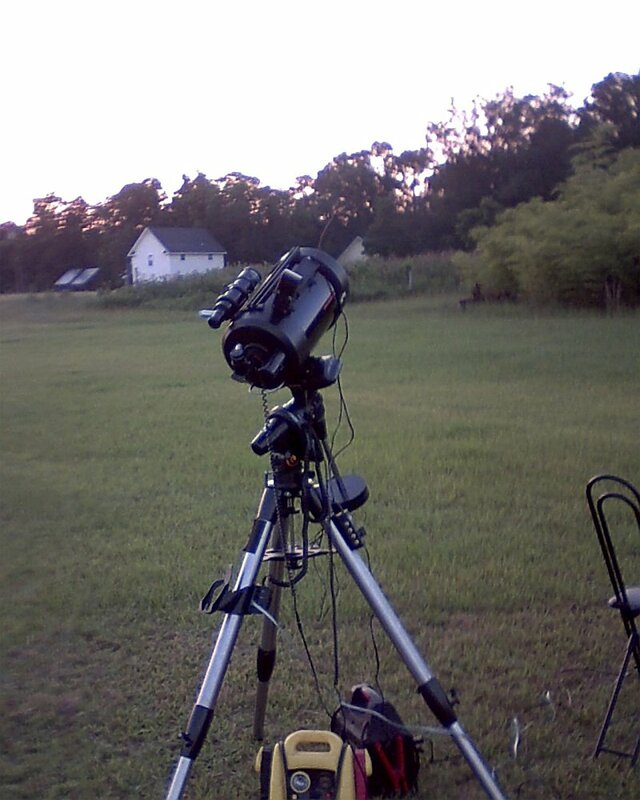 I pull-in lots and lots of targets with the SCTs and the Stellacam, but when the weather turns cool and crisp, I yearn for an experience more like those of the Herschels: quiet night, quiet stars, quiet telescope. I do not, I’ll admit, want to reproduce all of William and Caroline’s nights…there was that time the ink they were using for note-taking froze in its bottle. But after sitting under stagnant high pressure domes yielding heat indexes over 100 for months, even that don’t sound too bad. Not too long after I conceived of the Herschel Project, it occurred to me I didn’t know as much about William and his sister as I could or should—especially if my project might turn into a gull-derned book someday. I set about to rectify that by, at first, going back to the original or near original source material: Collected Scientific Papers by the man himself, and Sis’ Memoirs of Caroline Herschel. While not ponderous by any means (well, parts of Collected Papers are, I reckon), both these are antique in nature and not every general reader’s cuppa. What else is there? 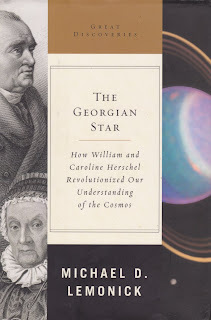 If you’d like to learn more about astronomy’s most famous brother-sister act, have I got the read for you: Michael Lemonick’s The Georgian Star. It is short, it is snappy, and it’s just one hell of lot of fun. I finished the book in two short sessions last May down at Chiefland, and was left more than satisfied. The whole story—well almost—is there, and when you’re done, you’ll have at least a sense of what Wilhelm and Carolina were all about. If there’s a single down-check for the book, it’s that, while Lemonick does a good job of delineating the basics of his subjects’ characters, we are left in the dark about their motivations. The Caroline of this book is at least partially a mystery. On the other hand, the author resists the temptation to psychoanalyze the Herschels, and, in some folks’ opinion, that’s all to the good. Otherwise, Lemonick is a talented science writer and seems well-grounded in telescopes and the sky. 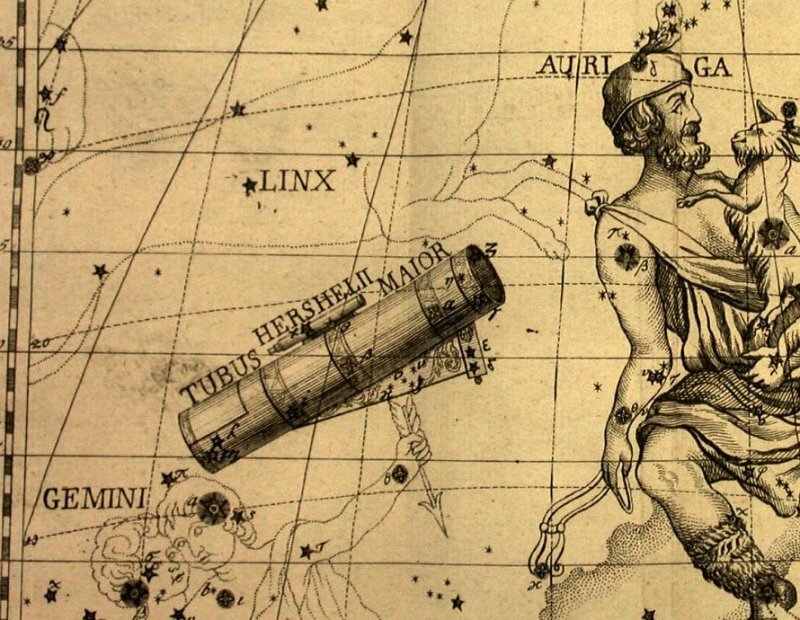 Most noteworthy is the author’s focus on the changes Herschel rung down on astronomy. When he began, the science was mostly descriptive in nature with much of its focus being on astrometry. Herschel was more interested in the “hows” and the “whys” than just the “whats.” As Lemonick concludes, he was, in some sense, the first Astrophysicist. In short? This book is a goodie. If you are interested in the Herschels’ amazing story, you could do way worse. It’s part of Norton’s Great Discoveries series and is readily available on Amazon.com. Re. the dead ASGT switch, here's a post I sent to the Celestron_AS group last Sep.
and these are undone easily as well. Also noticed something interesting: the power-switch said 0.4A MAX. the mount tracking, the voltage drops to 12.0V and when slewing 11.8V. I didn't do any current measuring. mount is 4 years old now). I'm getting used to your style of rapping and find it most enjoyable. I see you on the CGE PRO forum.....do you operate this mount?